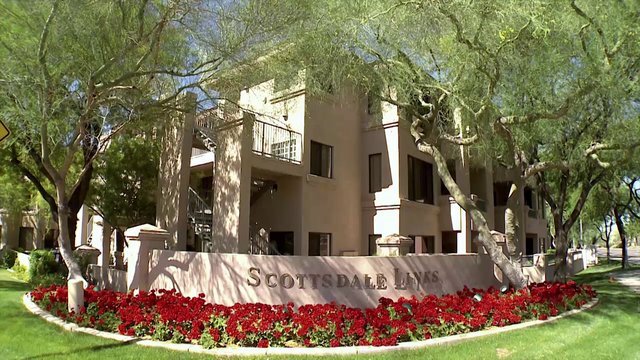 With a vibrant, lively energy and exciting events, Scottsdale Links Resort is a premier Southwestern destination. Enjoy a leisurely day at one of the championship golf courses, relax at any of the world-class spas or shop at the designer outlet malls. Fuel your adventurous spirit with endless outdoor activities, including kayaking, hiking, rock climbing, helicopter tours, Jeep® excursions, or test your swing at one of several nearby courses, including the lush TPC Desert Golf Course. Discover a vivid nightlife teeming with live entertainment, local bars and exciting dining options, Scottsdale Links Resort boasts well-appointed accommodations with private patios, relaxing swimming pools and hot tubs. The resort is a true desert oasis, perfect for any type of retreat. Discover the comfort of our spacious one bedroom accommodations featuring a king size bed, queen size sofa bed in the living area and full bathroom with bath and shower. Enjoy the convenience of our full kitchen equipped with a coffee maker, microwave and many other modern appliances. Each accommodation offers a separate dining room, private balcony/ patio, telephone, iron/ironing board and air conditioning. Discover the comfort of our spacious one bedroom accommodations featuring a king size bed, queen bed, and queen size sofa bed in the living area and full bathroom with bath and shower. Enjoy the convenience of our full kitchen equipped with a coffee maker, microwave and many other modern appliances. Each accommodation offers a separate dining room, private balcony/ patio, telephone, iron/ironing board and air conditioning. Discover the comfort of our spacious one bedroom accommodations featuring a king size bed, 2 queen beds, queen size sofa bed in the living area and full bathroom with bath and shower. Enjoy the convenience of our full kitchen equipped with a coffee maker, microwave and many other modern appliances. Each accommodation offers a separate dining room, private balcony/ patio, telephone, iron/ironing board and air conditioning. Driving: The resort is located off AZ Loop 101 Northbound, Frank Lloyd Wright, exit 38 or Westbound, Hayden Road, exit 35. Directions to Resort: Exit Phoenix Sky Harbor Airport East toward AZ 202 East. Travel East 3.7 miles to exit #9, AZ Loop 101 North. Travel 12.4 miles north to exit #38, Frank Lloyd Wright Boulevard. Continue north to Bell Road and turn left. Continue west .4 miles to North Perimeter Drive. Turn left on North Perimeter; the resort is on the right. Rich in color and resplendent in the Native American history of the Hopi, Navajo and Pueblo culture, the Southwest presents intriguing red rock formations, 225 million-year-old fossils and the multi-hued badlands of the Painted Desert. The ancient Petrified Forest, stretching from New Mexico to Arizona, is just steps from one of the Seven Natural Wonders of the World—the Grand Canyon. Encompassing the Colorado River and the adjacent uplands, the Grand Canyon provides visitors with breathtaking scenic landscapes. Housekeeping Service: Complimentary midweek service is provided on the third day of your stay. Additional cleaning may be requested for a fee. Shops Hours Open 24 hours. Closed 2am-6am for beer and wine sales. Please note that from April 2019– September, 2019 we will be doing renovations at our property. During that time frame you may expect noise Monday – Friday 8am-5pm. Also during this time we will be painting our exterior buildings. You can expect a contractor on your balcony during working hours. Please be advised that from June 20, 2019 - July 19, 2019 the children’s playground will be closed due to maintenance and quality improvement. There will be other activities in place during this time. We apologize for any inconvenience. - Property does not have the ability to accommodate oversized vehicles, trailers and recreational vehicles. - Guest reception is the first building on the left. - Hotel Guests and Exchange Reservation: A photo identification, credit card for $100 security deposit and a daily $21.95 plus tax resort fee will be required (cash is not an acceptable form of deposit). - Resort Fee includes Wi-Fi,recreational facilities (pools, spa, children's Splash Pad and garden playground), 24 hour Fitness Center, DVD rentals, seasonal activities, garden chess, garden gas grills, fire pit, 24 hour lobby coffee/tea, 24 hour business center computer/internet and boarding pass printing. - Owner Weeks and Member Points Booking: Photo Identification and credit card for security deposit will need to be provided at check-in. Resort fees* will be waived when staying on your owner week or member point reservations. A resort fee of $21.95 plus tax per night will be added to the reservation if the owner or member of THE Club® is checking in on a rental reservation.